Background Colorectal endoscopic submucosal dissection (ESD) can be technically difficult in some situations, such as paradoxical movement of the proximal colon. The double-balloon endoscope provides stable endoscopic maneuvering, even in the small intestine. 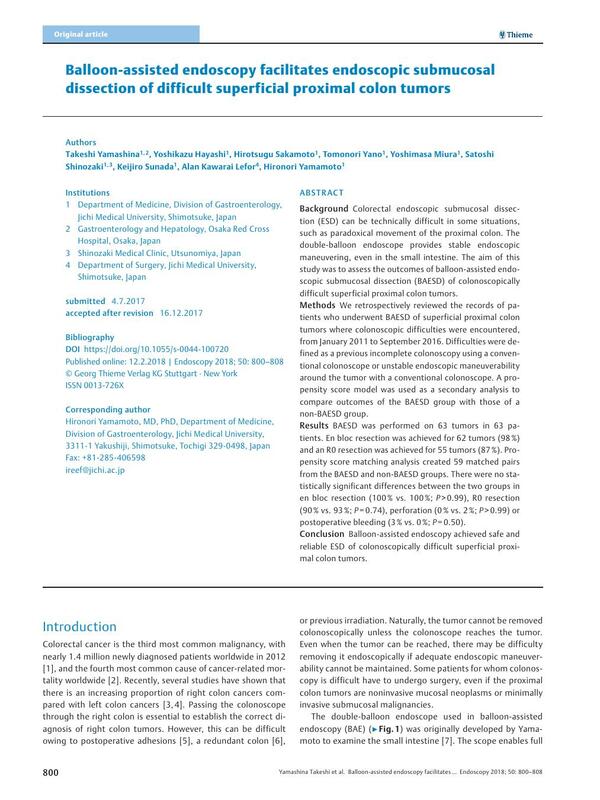 The aim of this study was to assess the outcomes of balloon-assisted endoscopic submucosal dissection (BAESD) of colonoscopically difficult superficial proximal colon tumors. Methods We retrospectively reviewed the records of patients who underwent BAESD of superficial proximal colon tumors where colonoscopic difficulties were encountered, from January 2011 to September 2016. Difficulties were defined as a previous incomplete colonoscopy using a conventional colonoscope or unstable endoscopic maneuverability around the tumor with a conventional colonoscope. A propensity score model was used as a secondary analysis to compare outcomes of the BAESD group with those of a non-BAESD group. Results BAESD was performed on 63 tumors in 63 patients. En bloc resection was achieved for 62 tumors (98 %) and an R0 resection was achieved for 55 tumors (87 %). Propensity score matching analysis created 59 matched pairs from the BAESD and non-BAESD groups. There were no statistically significant differences between the two groups in en bloc resection (100 % vs. 100 %; P > 0.99), R0 resection (90 % vs. 93 %; P = 0.74), perforation (0 % vs. 2 %; P > 0.99) or postoperative bleeding (3 % vs. 0 %; P = 0.50). Conclusion Balloon-assisted endoscopy achieved safe and reliable ESD of colonoscopically difficult superficial proximal colon tumors.